Terra Populus is a project designed to combine data sets and geographic information to facilitate finding and extracting data for research. Terra Populus has created a place in which spatiotemporal data about people and their geographic surroundings are made available for anyone seeking these data sets. The Terra Populus project was pioneered by the University of Minnesota and combines data sets from universities, researchers, and other data-gathering organizations around the world. The University of Minnesota, the Institute on the Environment, University Libraries, Columbia University, University of Michigan, and the University of New Mexico were all contributing organizations to the creation and continuation of the Terra Populus project. Numerous researchers and data sets were compiled to create a database that could be used by a variety of people and organizations to continue research and analysis of people and their environments. 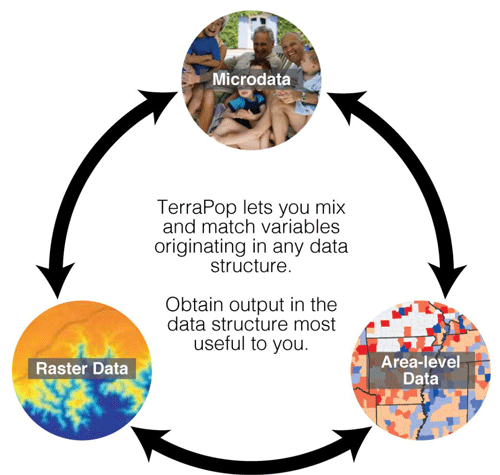 Data sets used in Terra Populus include population censuses and surveys, land cover data gathered from satellite images, temperature, precipitation, and climate data from weather stations, and land use data from remote sensors and surveys. 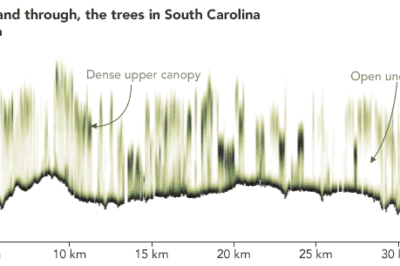 The data sets in Terra Populus can be used across time, space, and scientific domain, gathering information from a multitude of sources to make it even easier to compile the data sets researchers would want to include in their analyses. Data have been gathered from the University of Michigan and the partner universities to create a large database of information that can be viewed and analyzed in relation to one another in an almost endless number of combinations. 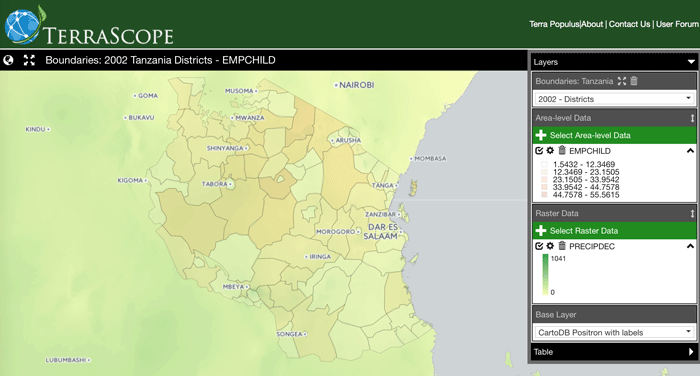 TerraScope is part of the Terra Populus project and is a map-based portal for visualizing the data sets contained in the greater Terra Populous database. TerraScope can be used to display color-coded maps with the data specified. 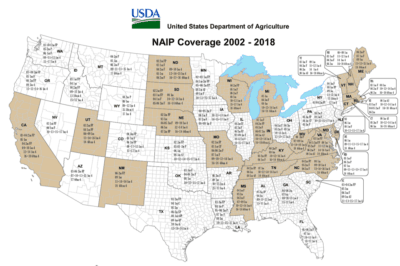 TerraScope includes census data from 160 countries around the world and includes data compiled from satellite images; these data sets include land cover, land use, and climate data. With the incredible amount of information in the Terra Populus database, choosing what data are the most important for a particular research question or analysis can be difficult. TerraScope has made it even easier to get the data researchers want the most with quick previews of relevant data sets. Users start out with a map of the Earth and the census data that is available for the 160 countries included in Terra Populus. Information on the specific time frame of the data can also be selected. Each country has the option to be analyzed specifically by state, county, province, or department. 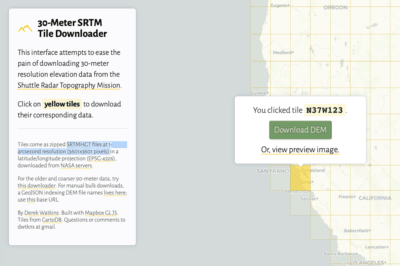 After population data, time frame, and location have been selected, the user can review any land use, land cover, and climate data that are available for that specific location. Environmental data can be combined with population data to see the relationships between the chosen data sets. More complex analysis can be done using the Terra Populus Extract Builder. A paper by Tracy A. Kugler, David C. Van Riper, Steven M. Manson, David A. Haynes II, Joshua Donato, and Katie Stinebaugh entitled ‘Terra Populus: Workflows for Integrating and Harmonizing Geospatial Population and Environmental Data,’ was awarded the Best Paper of Volume 11 of the Journal of Map and Geography Libraries. The paper was awarded for its innovation in accessing the variety of data sets that have been compiled as well as its ability to further research in many different fields. Terra Populus and Terra Scope are at the cutting edge of geospatial information systems for public use. In addition to assisting researchers and analysts with gathering data quicker and easier than ever before, this project can continue to bring people closer together to the information they need to make sense of the world around them.